Make an heirloom for your family! 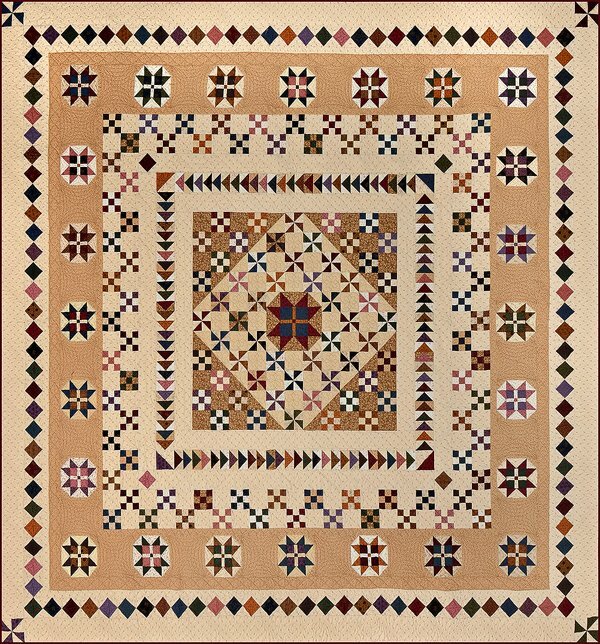 Cottonwood Creek is a stunning medallion-style quilt in the classic style of nineteenth century medallion quilts. Using a beautiful variety of light shirtings and classic dark prints, the pieced borders make your eyes dance around the quilt. There's a nice variety of different units and blocks in the quilt, and none are difficult to piece. All are made using modern piecing techniques requiring no specialty tools or rulers, and my directions and graphics will break it all down every step of the way!. Cottonwood Creek is made using all of the fabrics in Pam's Prairie Basics & Shirtings collection. Click here to see the collection. Finished quilt size: 99" x 99"